Silicon Valley icon and philanthropist for more than thirty years, Steve Wozniak has helped shape the computing industry with his design of Apple’s first line of products the Apple I and II and influenced the popular Macintosh. In 1976, Wozniak and Steve Jobs founded Apple Computer Inc. with Wozniak’s Apple I personal computer. The following year, he introduced his Apple II personal computer, featuring a central processing unit, a keyboard, color graphics and a floppy disk drive. The Apple II was integral in launching the personal computer industry. 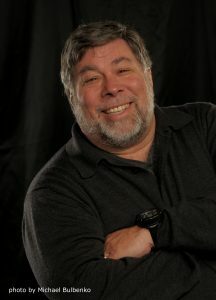 Wozniak is chief scientist at Primary Data and is a published author with the release of his New York Times best-selling autobiography, iWoz: From Computer Geek to Cult Icon by Norton Publishing. His television appearances include reality shows Kathy Griffin: My Life on the D-List , ABC’s Dancing with the Stars and The Big Bang Theory . In 2014, he was awarded the Hoover Medal, a prestigious honor given for “outstanding extra-career services by engineers to humanity,” and was inducted into the IndustryWeek Manufacturing Hall of Fame.